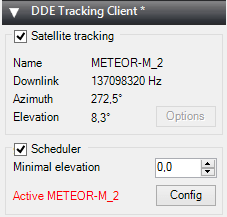 When I use automatic Doppler tracking with the DDE plugin with Meteor-M2, this results in lines (lost packages) in the image. It actually works best *without* Doppler shift tracking, i.e. the DDE plugin is not needed and indeed should not be used. For NOAA audio it is different, there Doppler tracking is necessary. I got things running, but now how do i involve AMIGOS analyzer and viewer as io receive data? In the tutorial i see something as run.bat but no mention of whats in that file. Can I use this plugin to decode other QPSK signals from different things? I want record baseband with the signal from Meteor M2, what sample format i should set in SDR# recorder? Meteor Demodulator plugin don’t work in SDR# v1444 on Windows 7 x64. Did you ever figure it out? I’ve been trying to solve this too on Windows 10 x64. Happysat–thanks for your accomplishments for us! I’m confused about your posts here of May 22 and 23, 2015. Please make me understand one or more thinks…. I don’t understand one think in the new tutorial about METEOR M2 real time… in the Receiving/Decoding NOAA APT images(tutorial) speaks about the Satellite Tracker plugin that is inside SDRSharp…When i open ORBITRON whit SDR via driver when NOAA 15,18, or whatever are close to me, the program send a command to this Satellite Tracker plugin inside SDRsharp and automaticaly makes freq corection and solve doppler effect ..its no need to set the main freq in SDRSHARP the software it’s doing all the thinks… but what about DDE it makes me the same corection in SDRSharp , or in the plugin to send data to QPSK? Sorry, not sure I fully understood, but I think I can answer. The DDE plugin interfaces with Orbitron and automatically sets the frequency in SDR#, according to the doppler shift – this is a rough correction. I think the QPSK plugin also does its own tracking, but on a smaller scale to improve decoding. Maybe happysat or someone can confirm. AMIGOS – Amateur Meteor Images Global Observation System. New LrptDecoder, please read AMIGOS Howto.txt inside the rar thanks very much. 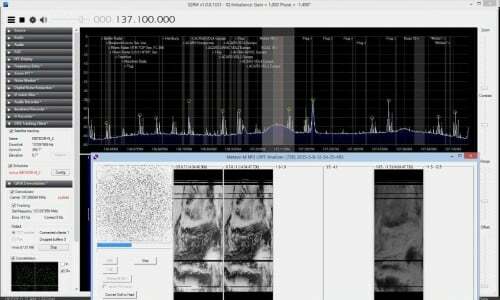 Hello Another quick update this time it should be a ‘final’ version – http://rtl-sdr.ru/uploads/download/qpskdemodulator.zip Changelog: Correction in tracking mode. If you like his work, one can consider a dontaion for his tremendous hard work last days and weeks to show your appreciation. I’m having trouble getting orbiter on to see the Sdr# driver, I have followed the tutorial, added the line pointing to sdr#, go back to orbit don and it’s not in the list of drivers, any suggestions anyone? At first it looks complicated but I’ve made 4 QFH antennas. 1 for UHF using 3mm copper enameled wire from an old transformer and PVC tubing. 1 for 137.5MHz made from RG6 coax, it works but I don’t recommend it as you can’t solder the coax braid, It’s steel. I made 2 QFH antennas from 2mm hard drawn copper wire (old telephone line) one for 137.5MHz and one for 145.5MHz. Either one receives Ham and wx satellites. MAR-6 homebrew preamp helps. I have ordered a couple of LNA4ALL (search this site) boards for my next project. I don’t seem to be able to find the correct link to download the DDE tracking client with Scheduler. Maybe the Google translated from Russian site doesn’t have it and I’m not game enough to click on any links in Russian as I don’t understand it. I’m using an old Tracking client without Scheduler which works fine with Orbitron but it’s basic without the scheduler. I managed to download the DDEshedule.XML document but is this it or am I missing something? When you save a Meteor image as an RGB125 BMP image, the image actually contains all the information for the three separate channels. If you wish to store your Meteor images for the future, this is the best way. The new version of SmoothMeteor recognises the 125.BMP part of the filename, and opens up the Palette menu. Here you find options to add palettes to the images. But you can also combine the channels in different ways: the RGB122 that is often used in LRPTofflineDecoder, but also the RGB125 (using the inverted channel 5), which is the same as the common colour composites made from NOAA HRPT channels 1+2+4. There are also options to save each of the individual greyscale channels. I’d love to get into receiving these satellites. Do I need a special antenna or will the antenna I have hooked up to my RTL-SDR work? I live on the 15th floor of an apartment building with a clear view of the sky. Hi Demian, you would need a special antenna to receive good quality images. There are 2 types known as a QFH antenna or the other is a Turnstile antenna. Both of these can be found on Google and made quite easily. A preamplifier also helps but for as for starting off is not essential. I have had quite good results using a standard scanner discone antenna with no preamplifier – the signal will fade in and out thats why the special antenna is required to stop that. 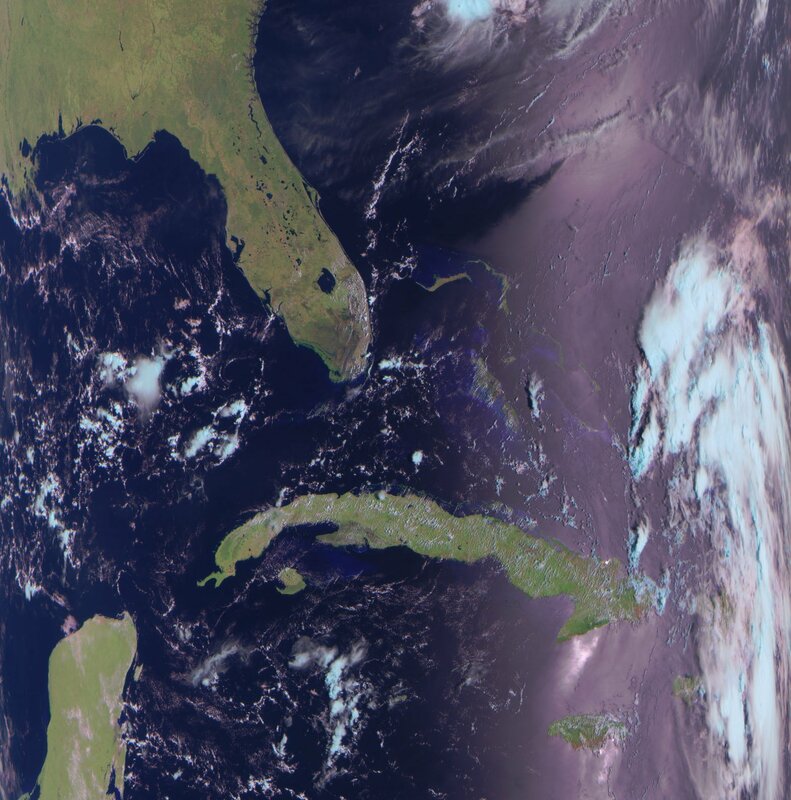 I would suggest to start decoding NOAA APT images at first, as these are the easiest to setup and get some results – Info on that is also on this site. It just requires a program called WXTOIMG and your good to go, with some adjustments to your sound settings. Check to see if you can already receive a signal from Noaa’s 15 18 or 19 if you can – give it a try with the software above. Good Luck!